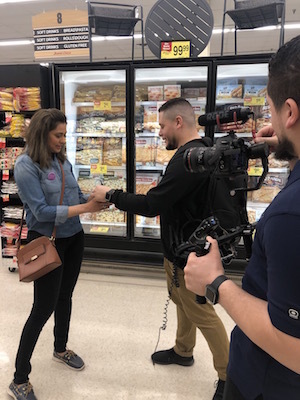 As part of Earth Month celebration, I recently attended Jewel Osco’s Earth Month Extravanganza at their kick off event at their Naperville location, and took a few friends with me. The event was all day and I couldn’t think of a better way to spend my Saturday. Lets just say, I will happily drive to any Jewel event anywhere in the future. I was one of the influencers asked to attend and promote the event. When we arrived, they had a cute gift basket waiting for me with my name on it. In it was also a gift card, which I will be putting to good use soon. The place was well decorated with Earth Day signs and a live band . Many little tables had been set up offering samples of various organic and gluten free products that Jewel offers. Jewel has always been one of my favorite grocery stores in the city, but learning about all the wonderful environmentally and health conscious products they offer only elevated their image in my eyes. There were over 40 natural, good -for-you brands there and here are some of my favorites. Rao’s Homemade Sensitive Marinara Sauce was super delicious. In the same vein, Lucini’s Tuscan Marinara sauce was divine. No sugar, low sodium! Albacore Tuna was serving a refreshing tuna salad that I kept going back for. I’m now a big, huge fan of Lakewood Juice, and will only be using their pineapple one for my summer cocktails! Speaking of drinks Kevita’s Lemon Ginger tonic was to die for. Monini’s Garlic & Chili Olive Oil will be my new obsession with bread. Pacific Food’s Garlic Barley Mushroom Soup hit the spot right. The girls and I raved about it for hours after. I had no idea that Amy’s Kitchen had breakfast bars, so yummy! I discovered egg plant for the first time, thats right, egg made from plants and it blew my mind. 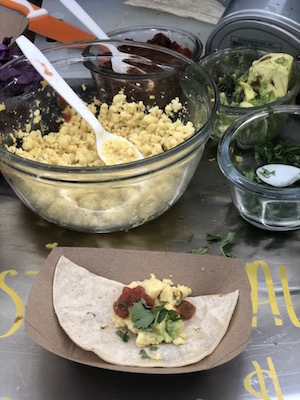 Huevos tacos have a whole new meaning. Absolut Vodka had the best giveaway of all, steel reusable straws. These will go with me everywhere from now on! We also got to meet Jojo, Jewel’s Mascot and my friend who was with me (also named Jojo) was stoked! I had fun shooting a TV segment with GT Universe and do a quick photo shoot. This was just the best time! We left with bags of giveaways, prizes and special offer coupons. I cannot wait for my next trip to Jewel, its going to be a blast!